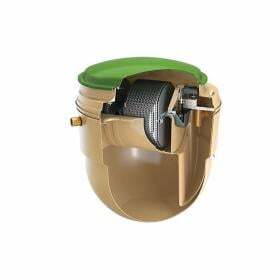 Easy Maintenance - At full occupancy the system only need to be emptied every 12 months, with maintenance of the compressor easily carried out located in the neck of the tank. Low Noise - With a near silent air compressor housed beneath the flat lid, the operation of the system is virtually silent. Raw sewage flowing to the CAP unit is received in the primary settlement zone. Here, gross solids (primary sludge) settle to the bottom of the tank, where they remain until the tank is desludged. The settled sewage displaced from the primary zone then flows into the submerged filter zone, passing under a scum baffle. Flow circulation in the submerged filter zone is generated by the hydraulic effect of the outlet air diffuser. This causes settled sewage entering the filter zone at high level to be drawn down through the media, aerating the sewage in the process. The flow circulation ensures that the influent sewage receives several passes through the filter bed at low flow. In the filter zone, as the sewage passes over the filter media it is purified by micro-organisms growing on the surface of the media. Growth of these micro-organisms results in an excess which is shed as solid particles known as humus solids. Humus solids settling at the bottom of the filter zones are recirculated with the flow of incoming sewage and are deposited on the top of the primary settlement zone. Sewage displaced from the submerged filter zone flows via a DIP pipe into the final settlement zone. Liquid displaced from the humus zone has now been fully treated and is known as final effluent. It is suitable for discharge to a watercourse or soakaway as defined in the consent to discharge issued by the Environment Agency. Humus solids from the final settlement tank are recirculated to the primary tank via the recirculation pipework. This helps reduce the sludge build up in the humus tank and prevents stagnation during very low inflow. Choose from either the Standard Gravity option where the final effluent runs down hill to the water course (or drainage field) or the Integral Pumped Outlet if the effluent needs to be pumped up hill to a watercourse (or drainage field). The standard invert depth of the CAP6 is 0.65m. If necessary this invert can be increased up to 1.55m by adding additional risers. The depths can be increased by selecting the invert depth required. This is a mains operated alarm which indicates if the blower inside the plant has failed so you can arrange a replacement quickly. Replacing the blower quickly reduces the distruption to the efficiency of the plant. FREE delivery of this product is available to UK Mainland and Northern Ireland locations at no additional cost. However due to the size of the product they are delivered direct from the manufacturer on a high sided articulated vehicle to the kerbside or a pre-arranged delivery point. In all instances the product offloading is the responsibilty of the purchaser. The HydroClear, represents significant progress for the domestic wastewater industry. 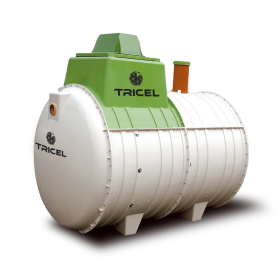 Contemporary design engineering and analysis software and sta..
Tricel Novo wastewater treatment plants are reliable, easy to install and simple to maintain for all wastewater requirements. The Tricel Novo subme.. 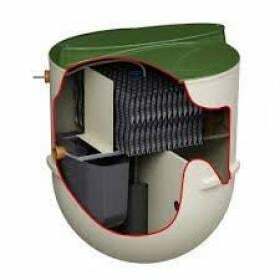 The Klargester Domestic BioDisc is a package sewage treatment plant desgined for use in domestic dwellings, small offices and light industrial premise..